I most certainly didn’t start out my day figuring that I was going to make a cardboard cat scratcher. And then after I started it I really didn’t have a clue that I wouldn’t get it finished because once I start business, I get business DONE. But, as they say, stuff happens. So today I’m going to how to put those Prime boxes to good use. 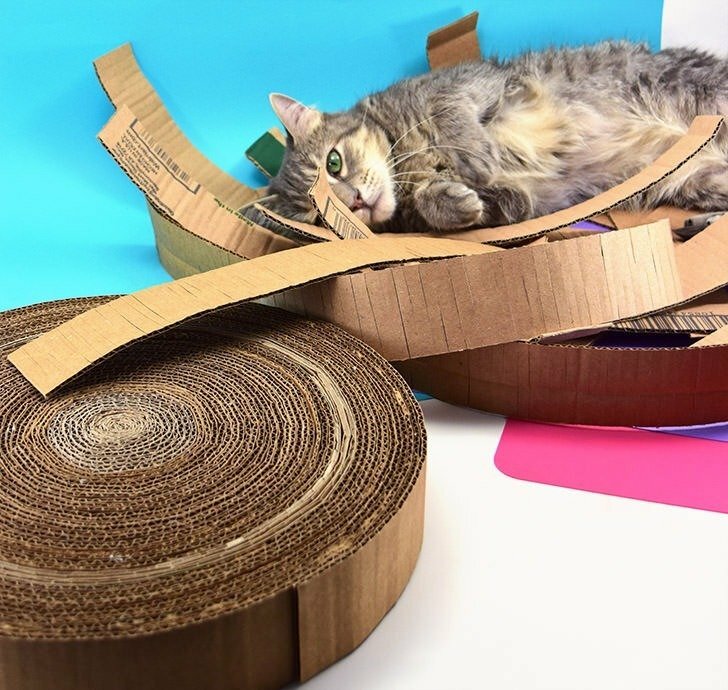 Let’s make a DIY cardboard cat scratcher from the boxes you’ve got piling up in the garage! 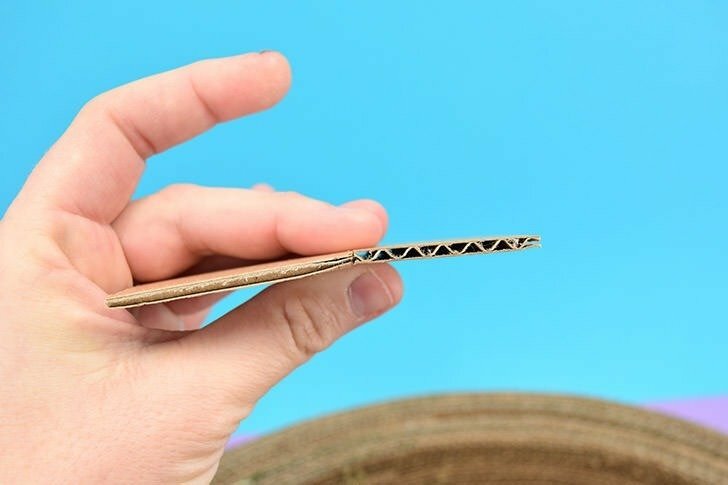 My road to making this cardboard scratcher was not an easy one, even though it’s a totally easy project. I woke up in a mood where I just didn’t want to work but I did I have a wild hair to get the house, especially my office/craft room crazy clean. As I worked around the house I noticed that my skittish little Marla, the kitty who has had so many vet visits, 2 surgeries and daily medication was actually looking more like her old self. She followed me around (yay!) 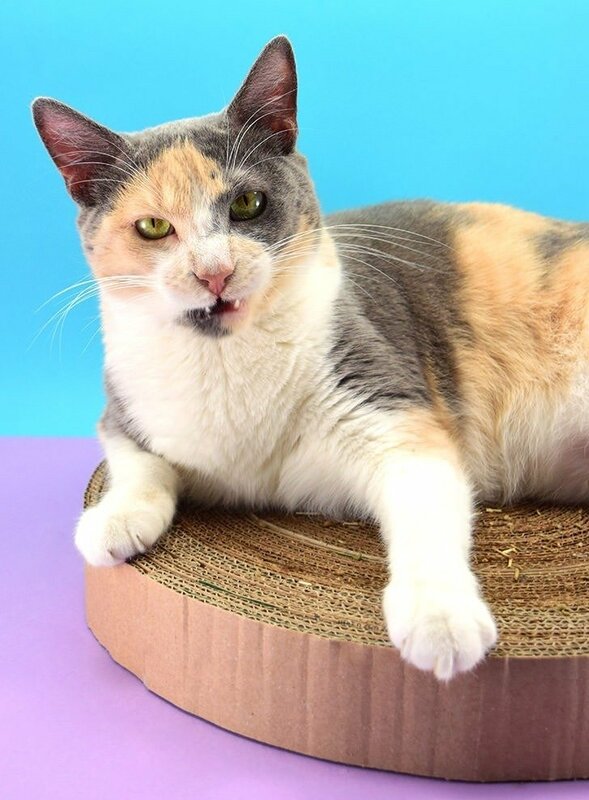 wanted to be pet (huzzah!) and she seemed to want to be seen instead of hiding away under the sofa. Around 4 in the afternoon I realized that “her” cat scratcher had been taken over by one of the other cats, Maybe, who wouldn’t let Mar near it. Since my little gray kitty has always preferred my DIY creations to store bought I went out to the garage and grabbed a decent sized box from my pile of Amazon Prime boxes I amass. I decided to make her a cardboard cat scratcher right then and there and put my broom to the side. It was all going well enough and when I thought, “this blade is dull, I’m going to hurt myself” and swapped it for a new one. And the very first cut with the new blade went right through my finger, all the way through the tip and right through the nail. I straight the heck up panicked and didn’t know what to do. Right away the first thing I thought was, I need to go to the hospital. And so I tried to call Mr. Rob to see about him running home to take me but he wasn’t answering his phone. And texting was difficult one-handed with blood everywhere so I simply texted “hospital” and then “please”. But then I started thinking… my emergency room co-pay went up from $50 last year to $500 this year. And they don’t have to pay if they decide this isn’t an emergency, even if feels to me an awful lot like one. And since my debit card got stolen earlier in the week, I had no way to even pay a $500 copay unless I ran through the bank to cash a check, first. This was all taking far too long! Want to see how to (safely!) 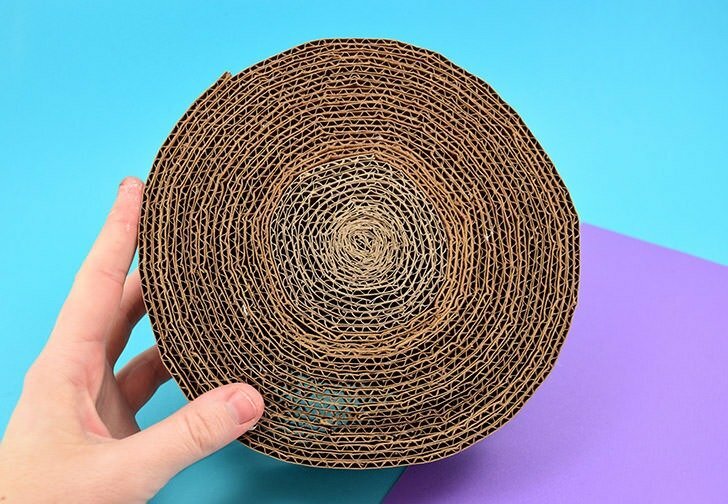 make a cardboard cat scratcher from the junk boxes that pretty much everybody has lying around in the Amazon Prime age? So these are my new cut resistant gloves by No Cry. When I cut myself it was kind of a big deal because I called everybody trying to find my sister to ask for her advice. 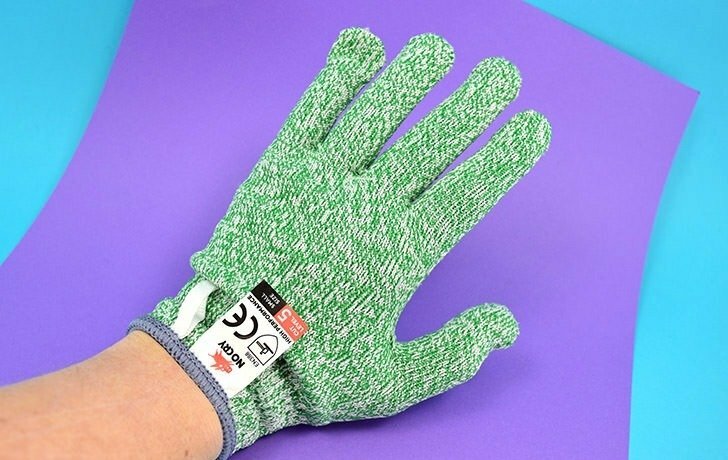 When I called my grandmother after leaving the doctor’s office the next day she asked why wasn’t I using those cut resistant gloves like they sell on TV? I had no clue what she was talking about but I found these guys online for a great price and since I was SO SCARED to cut cardboard again and pick this project back up they were super helpful. These aren’t a necessity, but if you’re clumsy like me these guys just might save you from a stressful and painful episode! 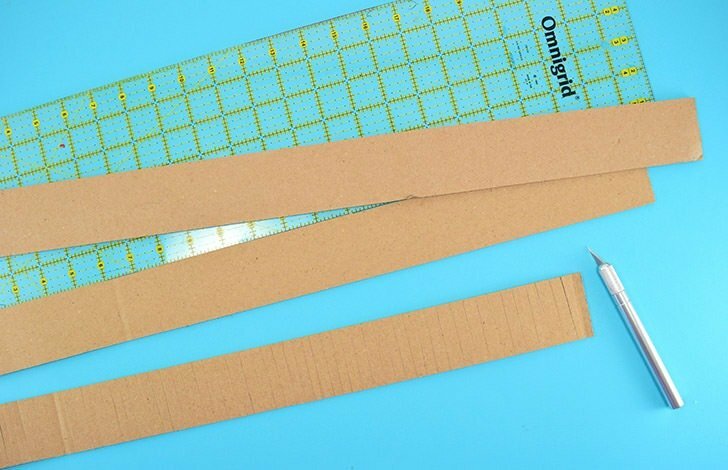 Grab those cardboard boxes and cut them into strips that are 2 inches wide. Using a quilting ruler makes it super easy because you can see through it and quickly match he bottom of the cardboard up with the 2″ hash mark, slice it, move it out of the way and shove it in further to cut again. When cutting your cardboard there is a right and a wrong way. If you cut across the cardboard you’ll see the corrugation inside, which is what you want, like the piece on the right. When you cut with the corrugation you get a closed off piece like on the left, which is wrong. The piece on the right will be sturdier and it’s much easier for your cats to grab onto. 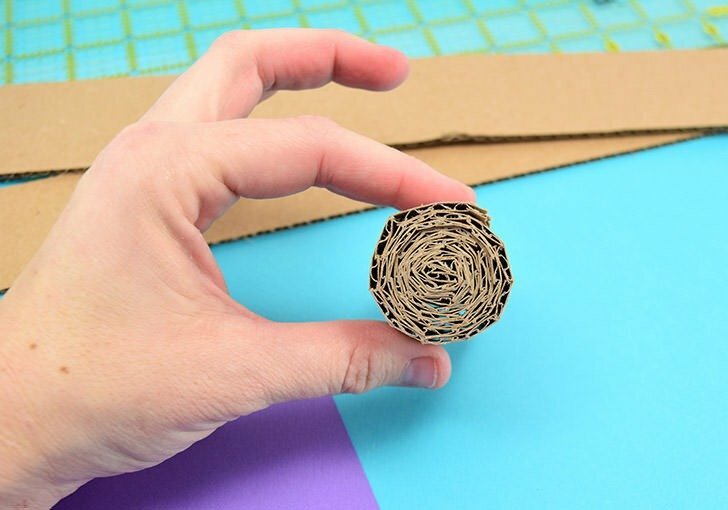 Once you’ve got a pile of cardboard strips you’ll need to score them so that they will make round shapes. 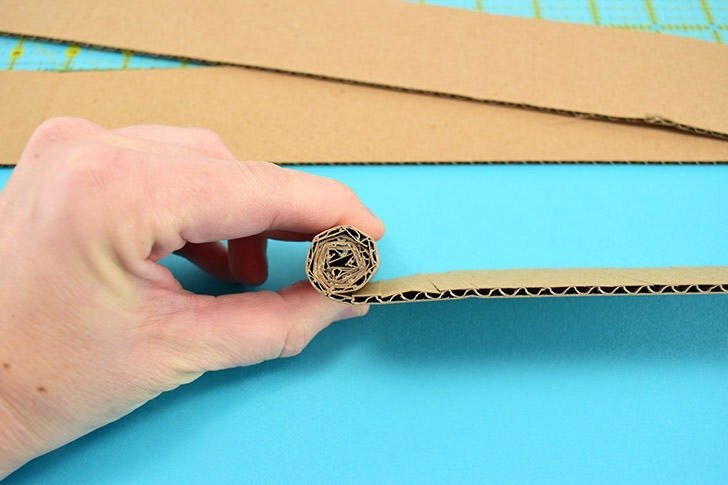 Just take your knife and make vertical cuts through just that top layer of cardboard the entire length down. 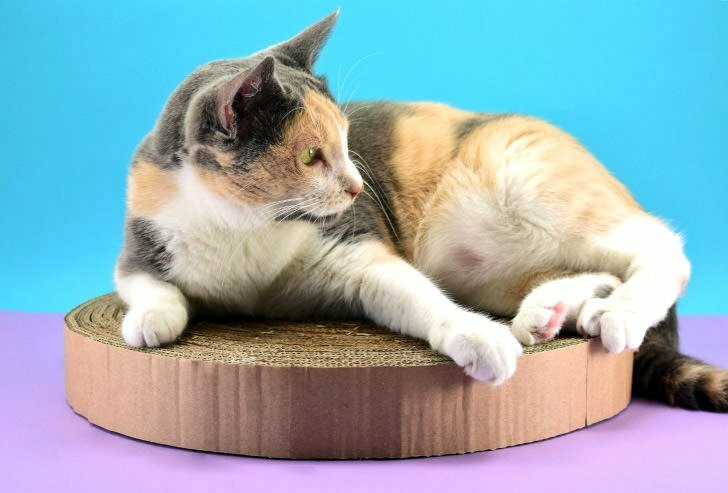 The closer the slits the tighter you can twist the cardboard around itself, so in the beginning, you’ll need cuts closer together than toward the outer edge of your cat scratcher. As a rule, I just kept mine around 0.25″ apart without stressing too hard if they were perfectly spaced but doing my best to keep the lines nice and straight. 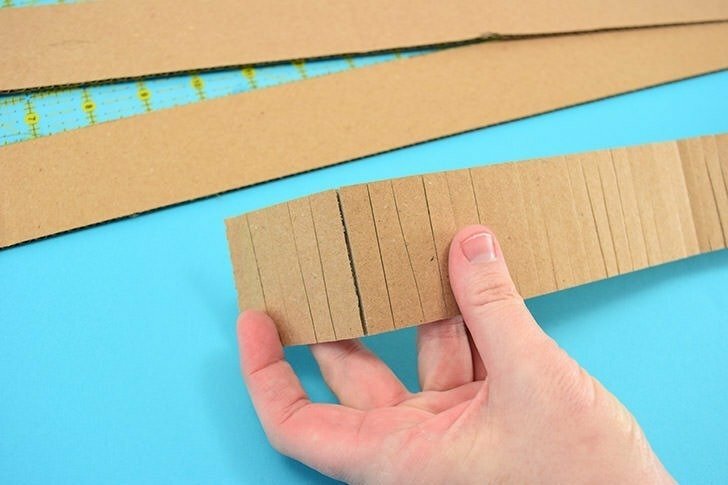 With the scored edge facing up, roll your first cardboard strip into a tight spiral, pushing it in as tightly as you can as you go. 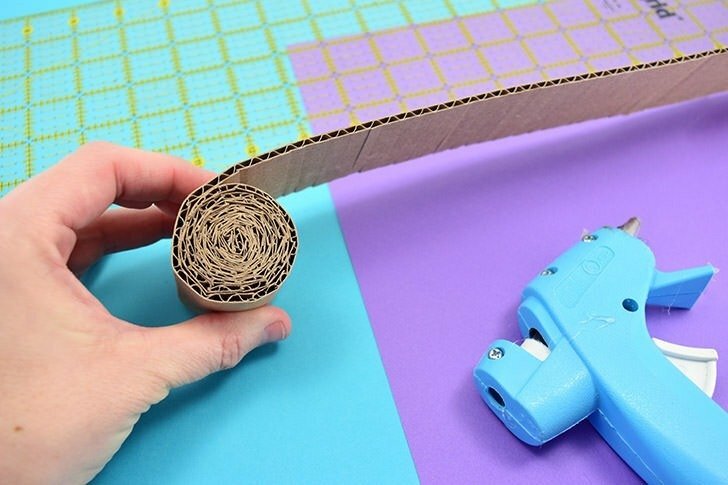 Unroll the piece and roll back up while applying a trace of hot glue along the middle to hold it together, adding more glue as you go. Once you get to the end add a little bit more glue to the very end to reinforce the entire piece. While it is pretty darn impossible to make every strip of cardboard perfectly 2″, we can still make this guy look perfect from at least one side :) Worrying about just that one side, make sure that the edge of the cardboard stays flush with the previous rounds for a nice, flat surface. 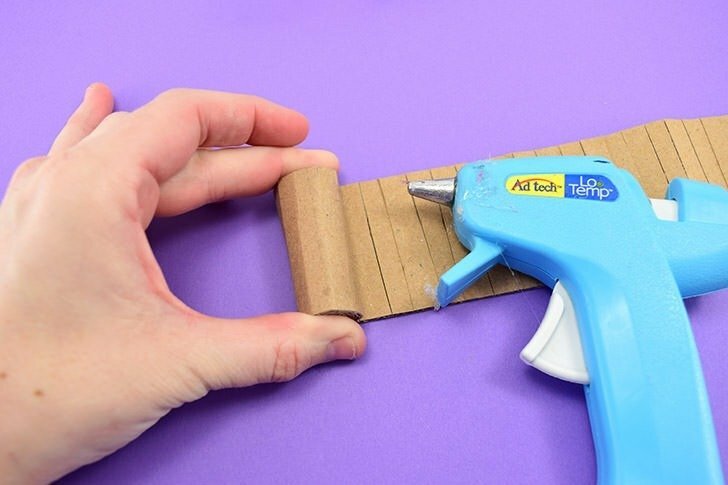 Continue adding to your initial spiral by gluing another piece of cardboard flush against the end of the first piece with the slit side continuing toward the roll. When gluing the ends of each strip feel free to make a thicker line or a little squiggle to keep things glued together well. 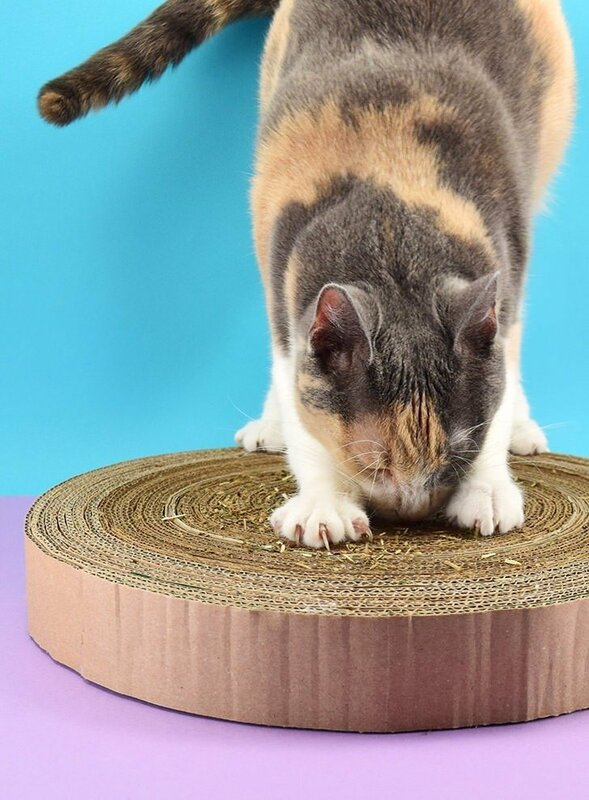 When wrapping the piece around your scratcher, you just need a trace to help keep it together. A bunch of glue isn’t necessary along here and it only makes the project more expensive when you find yourself eating up hot glue sticks as you go. 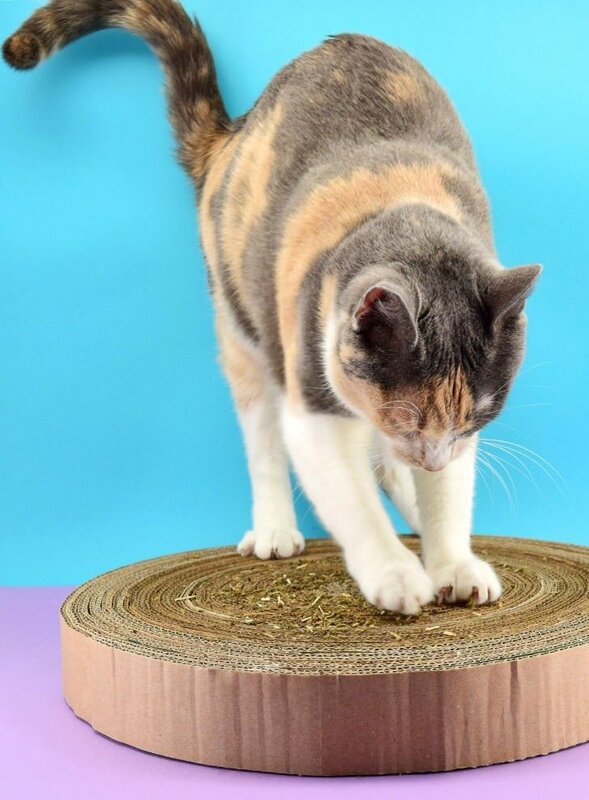 Continue adding strips to build the scratcher as wide as you need for your cat to comfortably perch on it. Mine is right about 15 inches wide and used 3 medium sized Amazon Prime boxes, though I think I might add another inch around to make it a little bigger for the big gal up there. 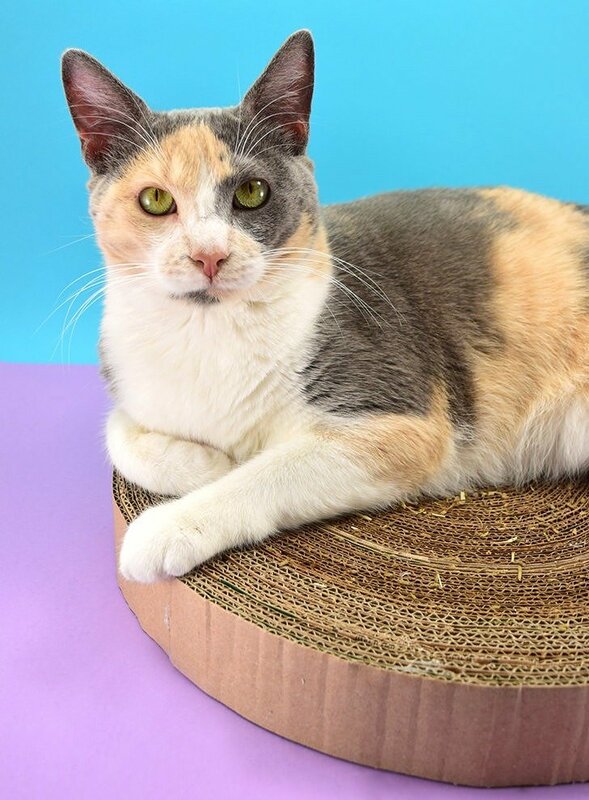 Now while I was working on this I was constantly shooing the kitties away and then when the cardboard cat scratcher was done they weren’t having any of it, having been shooed away from it so many times. 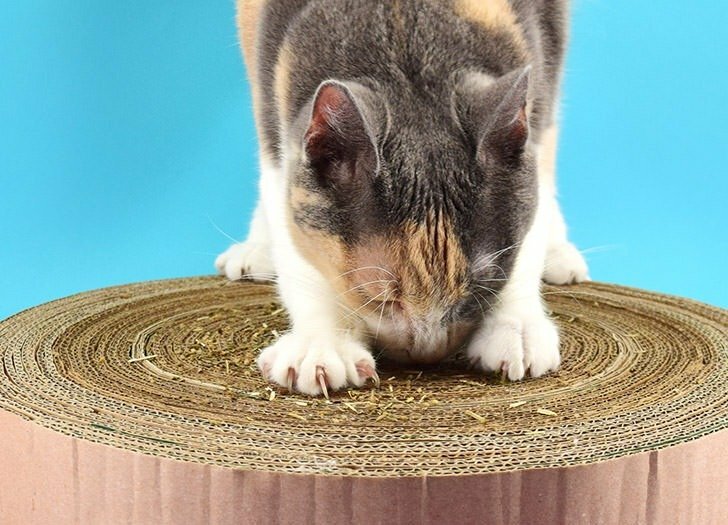 If you find yourself in a similar predicament, using loose catnip, or catnip spray for less mess, will entice kitty to use this scratcher. I promise then they’ll be in LURVE. 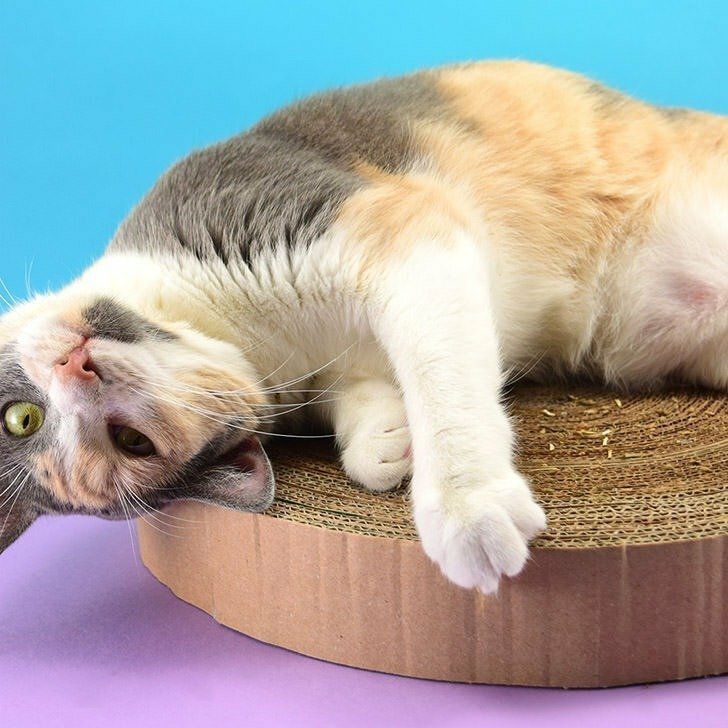 And, who knows, maybe this easy DIY cardboard cat scratcher just might so happen to save some of your furniture and help to reduce that cardboard box stash in the garage to boot! I love this! Our cat has the plastic circle with the ball that goes round and round and one of these in the middle…I’ll make the next replacement pad instead of buying one! Also, your cat has the most GORGEOUS eyes! Thanks so much! 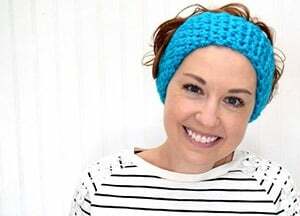 Maybe is our resident beauty, I think :) Good luck making your scratcher. I’m finding that they last SO MUCH LONGER than the store bought ones, though I’m not sure why.